Discovered almost by accident, the new ‘salmon’ colour which features in varying measure across all four of the new watches was originally a custom detail requested by a private client for a different model. Seeing just how well it worked, the decision was taken to produce a limited run of the Faubourg de Cracovie featuring variations on a similar theme. More than doubling in size, the existing collection of three references welcomes an additional four new limited edition models, in combinations which centre around the use of salmon (using a unique blend of gold, palladium, platinum and silver) and blue primaries, and the salmon theme is playfully integrated into the collection titles as the models have been christened with names like Sockeye, King, Coho and Chinook - all species of salmon. 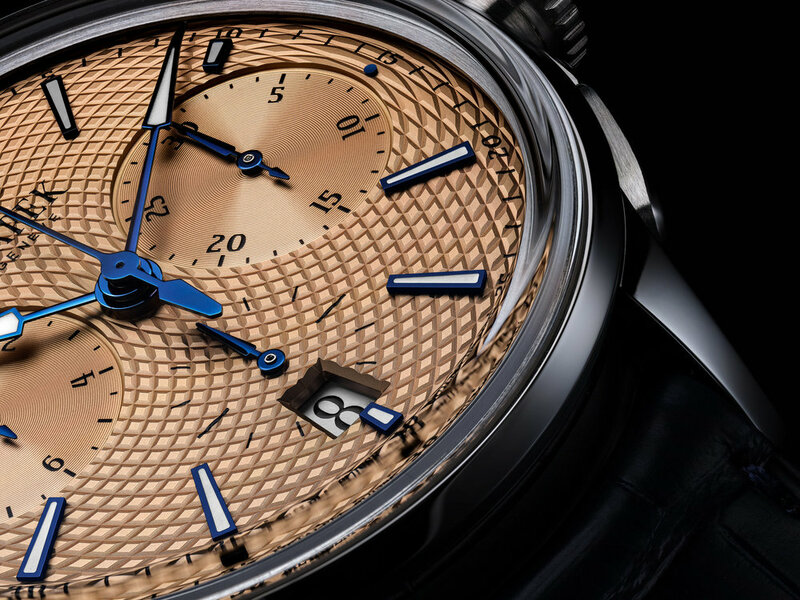 Each new version features a Résonance guilloché style, which is derived from the brand’s signature ‘Ricochet’ pattern of deep and swirling guilloché engraving, which emanates from around the two chronograph subdials at the three and nine o’clock positions. The Sockeye, King and Coha models all feature the salmon dial, with subdials in blue (Sockeye), silver (Coha) or uniform (King). Blued steel hands and applied numerals make a very effective contrast. The Chinook is the odd one out, and makes use of deep blue as its primary colour, with salmon subdials. Box-style sapphire crystals give a cool, vintage look to these all stainless steel watches, and equipped with a bespoke self winding calibre by Vaucher Manufacture Fleurier, the Faubourg de Cracovie is certainly a more than capable and stylish contender for the boardroom chronograph, and these new dials take that to a new level. Only eighteen of each will be produced, so exclusivity is built in.